Canada has approved the sale of FrankenSalmon, aka, GMO Salmon. Until this announcement by Health Canada, the only GMO foods approved for sale and human consumption have been crops. AuquBounty, the company behind the GMO Salmon said it will be another year before the fish will be available in stores. Health Canada and the Canadian Food Inspection Agency have found the fish to be as safe and nutritious as conventional salmon. The scientific reviews of the AquAdvantage Salmon were rigorous and thorough. Massachusetts-based AquaBounty Technologies is responsible for the development of the AquAdvantage Salmon. They say that the salmon “grow twice as fast as conventionally farmed Atlantic salmon” due to the addition of genes from an eel known as an ocean pout and the Chinook salmon. GMO fish, approved in November 2015 by the U.S. Food and Drug Administration, has been challenged in the United States by environmental, commercial and recreational fishing organizations and consumer groups. Should restaurants who serve this salmon divulge it is GMO? 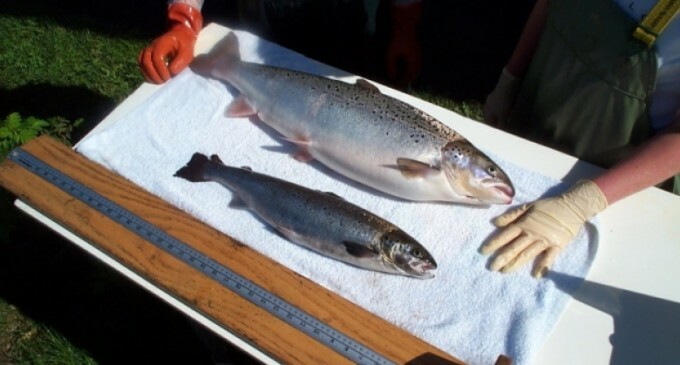 Are you okay with genetically modified salmon? Read more on the next page. Wild caught is the best. Don’t buy any fish that is farm raised. Then why the$#%&[email protected]*have it mutilated?!? Nothing wrong with it, we’re just improving on nature.